Right across Ocean Boulevard from the gorgeous Atlantic Ocean is Ocean Terrace North Myrtle Beach resort. 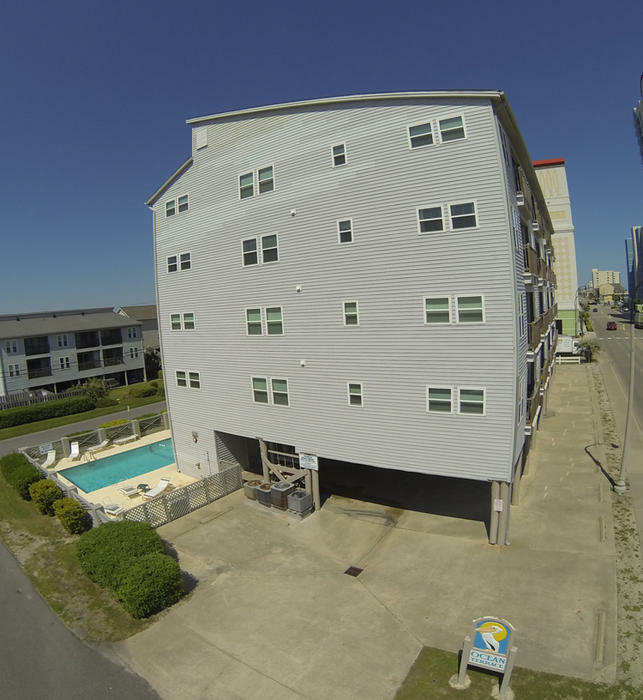 This four-story North Myrtle Beach resort is in the Cherry Grove section of North Myrtle Beach, South Carolina and blocks away from the very popular Cherry Grove Fishing Pier. Featuring a swimming pool, covered parking and easy beach access, this North Myrtle Beach resort also puts your family just minutes away from live entertainment theatres, around the corner from delicious restaurants and in close proximity to more than 100 Myrtle Beach area golf courses. Ocean Terrace is a second-row North Myrtle Beach resort that offers guests the options of a two-bedroom, two-bath North Myrtle Beach vacation rental or a larger, three-bedroom, two-bath North Myrtle Beach condominium. All of the North Myrtle Beach condo rentals at Ocean Terrace are quite comfortable. It is just a matter of how much space you need for your family vacation at the beach. This North Myrtle Beach resort is only four stories tall and each floor of Ocean Pointe only has six North Myrtle Beach condominiums. This intimate setting makes for a peaceful and quiet North Myrtle Beach vacation. This four-story building sits on top of stilts, which allows for covered parking on the ground level. An elevator and a stairway leads from the ground level parking to all the floors of this North Myrtle Beach resort. Ocean Terrace has a sparkling blue swimming pool and a spacious pool deck. This pool deck is a popular place to just relax and enjoy your North Myrtle Beach vacation day. All of the North Myrtle Beach condominiums have a private balcony. Some of these balconies face the Atlantic Ocean side of the North Myrtle Beach resort. These North Myrtle Beach rentals can sleep either six or eight people. And some of these condos in North Myrtle Beach, South Carolina come equipped with high-speed Internet. Some of these North Myrtle Beach condo rentals are also non-smoking. Peruse the amenities of each North Myrtle Beach vacation rental at Ocean Terrace and you decide which one will best meet your North Myrtle Beach vacation needs. You can find a North Myrtle Beach condo at Ocean Terrace that has a balcony with fantastic ocean views, even though this North Myrtle Beach resort is across the street from the beaches. All of these North Myrtle Beach condominium rentals have a beautifully furnished kitchen. There is a washer/dryer unit in these North Myrtle Beach rentals, too. Each of these condos in North Myrtle Beach, South Carolina has at least one DVD player so you can watch movies during your North Myrtle Beach vacation. Elliott Beach Rentals is not affiliated with onsite management or the HOA of Ocean Terrace.